i like the of lighting and the placement within the composition. i would love to see the completed project. the second picture has interesting composition. but i don’t really think the shadow work really well. i actually like the first one background. the picture kind of tell us story. I love the concept of an object in different settings. I also like the use of lighting in both images as well as the tuxture of the ground in the top image. I think this concept could be very whimsical and successful if it is taken in the right direction. Exaggerating this animal and personifying it in multiple circumstances could really enhance this series. For example, he could be holding a typical bandana on a stick like a runaway child, rather than just being in one pose the whole time. Composition wise, I think the top photograph is better composed. The color along with the setting and placement of the subject evokes a truly desolated sentiment. I don’t know what it is about the toy kitten – perhaps it’s the look on it’s face or the fact it looks like some sort of kitten-sheep-llama hybrid – but it’s just so… sad. The idea behind the book is fantastic. I would love to see more images from the series. I think the first of the two pictures here is the strongest, and I particularly like the eerie green, glow in the background. Great job. Compositionally I wish both of these photographs were identical. I think it would dramatize the already very different location/lighting/colors in each photo. I like the idea of this being a series that tells a story because a runaway kitten seems like it would be a children’s book however the first photograph leads me to believe that it could be a much darker narrative. I really enjoy the idea of this series. It is comical but also can speak to not so comical things in real life. It will be interesting to see other places where this kitten shows up. I believe these places will say the most about the image since the kittens expression will not change. I like the situations that the kitten is in these two photos, it looks very alone but calm. This will make a good book! I think the top image is the stronger of the two. It conveys your idea more without knowing what it is. The lighting and environment seem to fit the expression on the kitten’s face and bring to mind that sense of destitution run away children have living on the streets. I suppose the series will give the images more context, but the bottom one seems to me like the focus is not necessarily about the kitten, rather it just happens to be part of the entryway to the house. I think your concept is entertaining, and it will make an interesting children’s book. 🙂 Between the two photographs the top one is my favorite simply because of the contrast of the adorable kitten and the dark alley. Just the way you composed it, and it’s lighting sets up the mood well. There’s something sweetly pathetic about that cat doll. In the first photo, left in the gutter or what looks like an intersection there is a greater sense of loss and wonder than in the second. The second photo is beautifully framed but I guess I’m more of a fan of macabre than beauty. In the second photo there’s little to no question what that cat is doing there: the little girl who lives in side that house with those planters and tended flowers left it out on the front stoop. That may not have been the case when you were shooting it, but that’s the only story that immediately comes to mind. In the first photo I can’t help but wonder and ask, “Where the heck did that thing come from, what is it still doing there and why is it staring at me? !” Kudos on both. They are both very good and interesting images. In the first image, the lighting is very dramatic. The color looks soft and relaxing. It really brings out a feeling of loneliness. The second one is not so strong, but I like the shadow on the door. It’s like the toy kitten is waiting for someone to comeback or letting her in. Placing the subject at the corner of the image is a smart choice. The color of the second one can be more dramatic, or you can use cooler colors in both images. Making a book of this series is a fantastic idea. They are both very good and interesting images. In the first image, the lighting is very effective. The colors are warm and relaxing. It really brings out a feeling of loneliness. For the second image, I like the shadow on the door. It make me feel that the toy kitten is waiting for someone to come back and to let her in. Placing the subject on the corner of the image is a smart choice. I prefer the first one than the second one because the first one feels more dramatic. In order to improving the second one, I think you can try to make the color more saturated, or adjust the color to a cooler tone for both images. Making a book of this series is a fantastic idea. I like particularly in this image that although the stuffed animal is obviously just a toy it has a sense of emotion with it that is relatable on a human level. Especially in the top image where you did a fantastic job capturing shadows and using light to create a focal point for the composition. I really like the first image in the dark alley, but I’m not so sure about the feel of the second one. The first image gives more of a story and evokes more emotion (at least for me personally); while the second one doesn’t make sense to me at least for the theme you are aiming for. 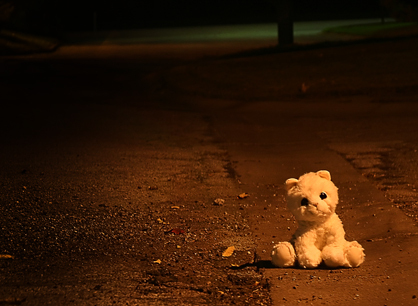 The first image gives off an empty/lonely feeling like the kitten would feel if it were running away from home. The lack of other focal points in that photo help to really drive those emotions across; as well as the medium/long depth of field that helps us to see how truly empty the space is. I feel like perhaps there is too much going on in that second photo to be able to really feel anything strong. Perhaps playing with the focus, or even moving the kitten away from the porch so that the house is more of a backdrop rather than a focal point would be helpful. I think the concept is a great subject to photograph but I wonder what the other images look like. Are they all places outside or he the cat taking sanctuary in some places? I think having the cat placed in the right corner will get redundant depending on how many photos are in the series so I think moving it around could help a lot. Also having the cat face the opposite direction as if the viewers are seeing what the cat is seeing could draw the audience in. Love both of these photographs. I think it gives an animated perspective of stray/abused animals. The lighting and composition are both impressive and I would love to see the finished project. These are adorably creepy. 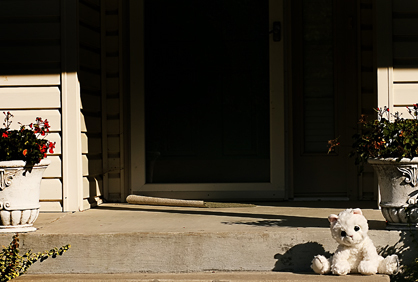 The contrast of a cute stuffed animal against the harsh shadows really works. I would like to see a third image. These have a super eerie feel to them. I’m conflicted on the background because they both are so dark and have such minimal information, but maybe that’s the point? I like the bright hint of green in the first one and how you can see the house and then it just kind of disappears in the second one. It’s a weird feeling because stuffed animals are supposed to be so cute but these are so mysterious. I like how the background seems to be just as important as the kitten, which helps draws the viewer in.